Sri Lanka's Liberation Tigers of Tamil Eelam (LTTE) are accused of forcing young people to join their ranks, ahead of a possible battle with government forces for the north of the country. People in rebel-held Kilinochchi say that Tamil Tigers have introduced a policy of demanding one person from each family. The Tigers - who want a homeland for the island's Tamil minority - have been pushed back from the east of the island, but they still hold a large swathe of territory in the north. In Kilinochchi market, farmers bring in their produce from surrounding areas to sell. Bunches of green bananas, rice and orange-coloured king coconuts are weighed on a large set of industrial scales. Here, as elsewhere in the rebel-held territory, Tamil Tiger posters are pasted to the walls. They show fighters carrying assault rifles, and slogans urging recruits to join. But now there is new evidence that the organisation is forcing civilians into its ranks. "I went home, but I lost my house," says one man in his 20s who cannot be named for his own safety. 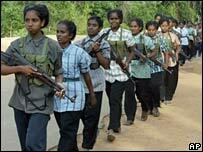 "They asked me if my family had any LTTE members. 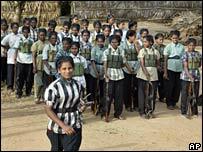 When I said no, they said that I must join the LTTE, because each family must have one LTTE member." The man said he was abducted and forced to become a Tamil Tiger fighter. But he escaped, and is still in hiding now. He is not the only one. Women too suffer the same fate. "Every home received a letter," one woman who did not want to be named told the BBC. 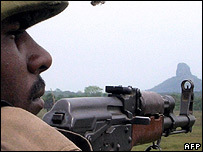 "They underlined my name and told me that I would be recruited into the LTTE. "They wrote a date and time and said I should hand myself over at that time. "If a representative of the family doesn't join, they will come and get him or her instead." In the past year of fighting, the Tigers have lost vast tracts of territory in the east of Sri Lanka. The rebels still run a diminished, de facto state in the north. But government forces could soon shift their focus there. The Tigers are preparing for the next stage of the war. But the head of their political wing, SP Thamilselvan, denies they've introduced a form of conscription. "We have brought in some practical regulations, because there were many cases of two, three or even four people joining from single families. "Their livelihoods were being affected, because they were the breadwinners. "Also we are sending back the underage children, so we request the adults to come. When we explained this to the people, they chose to join us." Aid workers say the Tigers' recruitment policy is well-known, and has even affected the humanitarian effort. Most international organisations in rebel-held areas are sheltering some local staff. Some have not left their compounds for months. Arne Bangstad is head of the Nordic aid agency, Forut. "We do experience that staff of all the different non-governmental organisations are getting abducted or have tremendous pressure put upon them, because they want to recruit them," she said. "We have been promised by the political wing of the Tigers that such recruitment should not take place, and that the humanitarian status of the NGOs would be respected. But in practicality, we find that this is not really the case." Meanwhile, in a secret part of the jungle, recruits are being trained in handling rifles and rocket-propelled grenades. Not all have been forced. Many joined the Tigers voluntarily, to fight for an independent homeland for the island's Tamil minority. But the firing is a reminder that service with the rebels is likely to be active, and some face going to the front lines against their will.